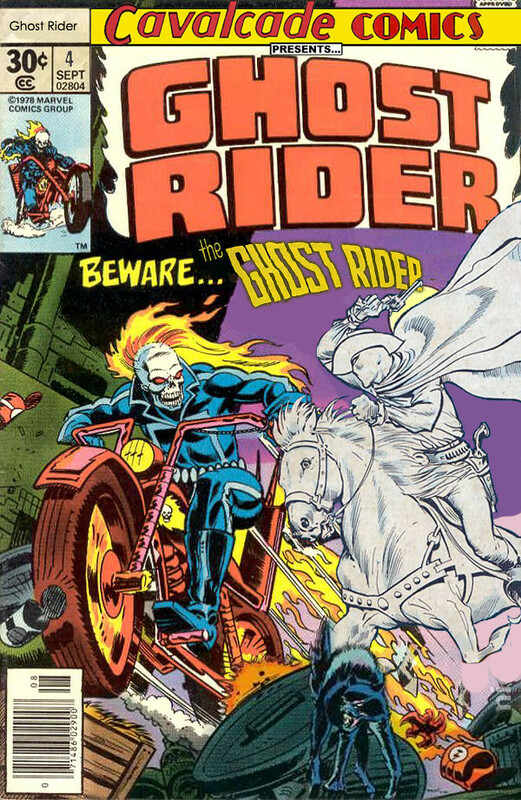 Cavalcade Comics #4 – Ghost Rider vs Ghost Rider Halloween showdown! Welcome to issue #4 of my Vintage Comic Throwdown series where I pit character vs character in a vintage comic book cover showdown. This time, since we are only DAYS away from the start of AWESOME-tober-fest 2014, I thought I would do a somewhat Halloween-type throwdown featuring two “supernatural” characters. 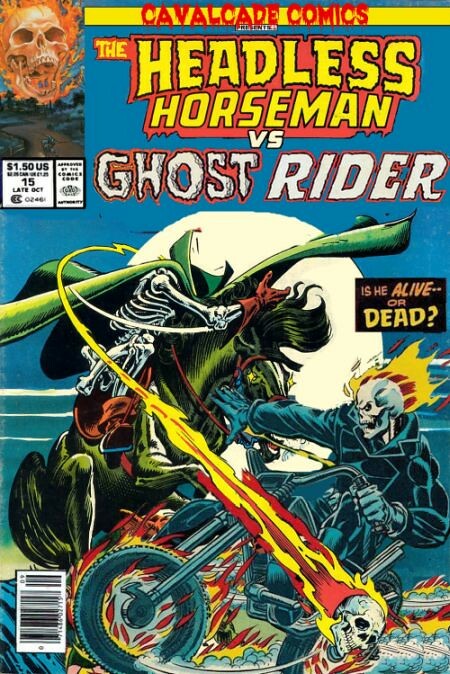 And I chose two incarnations of the Ghost Rider character. Check out my cover for Cavalcade Comics #4 – Ghost Rider vs Ghost Rider. 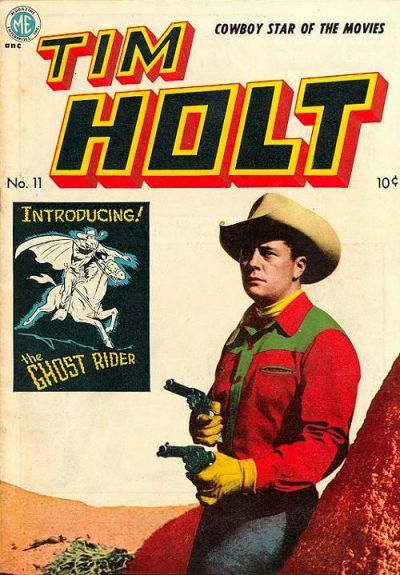 Many people may not realize that Ghost Rider actually started out as a Golden Age gunfighter character that debuted in 1949’s Tim Holt Western Comics #11. The character was originally owned by Magazine Enterprises but was bought out by Marvel and revamped in the 70s into a motorcycle riding demon. And now I have them battling each other on the city streets. 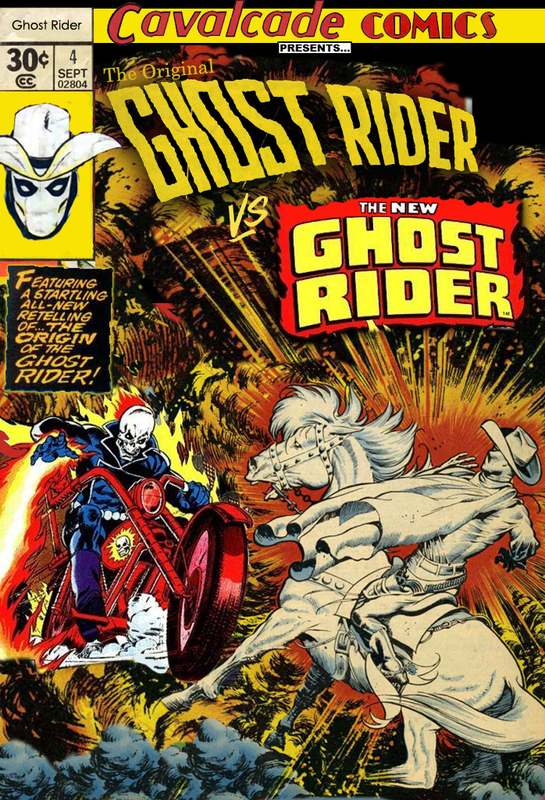 For those that like to know, this cover is primarily based on Marvel’s Ghost Rider #31 from 1978 (left) and I took the original Ghost Rider from Ghost Rider #2 from 1950 (right). Because this is a special Halloween issue, I decided to make an alternate cover. This second cover is based instead on an old Golden Age Ghost Rider cover instead of the newer Marvel cover. Imagine that this is the direct cover and the previous one is the newsstand cover.